The online version of this article ( https://doi.org/10.1186/s40168-019-0675-9) contains supplementary material, which is available to authorized users. Viruses are the most abundant biological entities on earth; they are virtually present in all ecosystems [1, 2]. By lysing their hosts, viruses control host abundance and affect the structure of host communities . Viruses also influence their host diversity and evolution through horizontal gene transfer, selection for resistance and manipulation of bacterial metabolisms [4, 5, 6, 7]. Importantly, viruses affect local and global biogeochemical cycles through the release of substantial amounts of organic carbon and nutrients from hosts and assist microbes in driving biogeochemical cycles with auxiliary metabolic genes (AMGs) [8, 9, 10, 11]. The presence of AMGs in viruses has been described previously; AMGs are presumed to augment viral-infected host metabolism and facilitate production of new viruses [4, 12]. AMGs are most extensively explored in marine cyanophages and include genes involved in photosynthesis, carbon turnover, phosphate uptake and stress response [13, 14, 15, 16]. 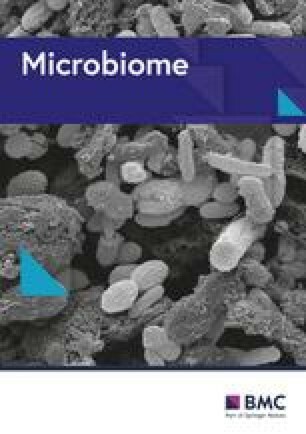 Cultivation-independent metagenomic analysis of viral communities has identified additional AMGs that are involved in motility, central carbon metabolism, photosystem I, energy metabolism, iron–sulphur clusters, anti-oxidation and sulphur and nitrogen cycling [10, 17, 18, 19, 20, 21, 22]. Interestingly, a recent analysis of Pacific Ocean Virome data identified niche-specialised AMGs that contribute to depth-stratified host adaptations . 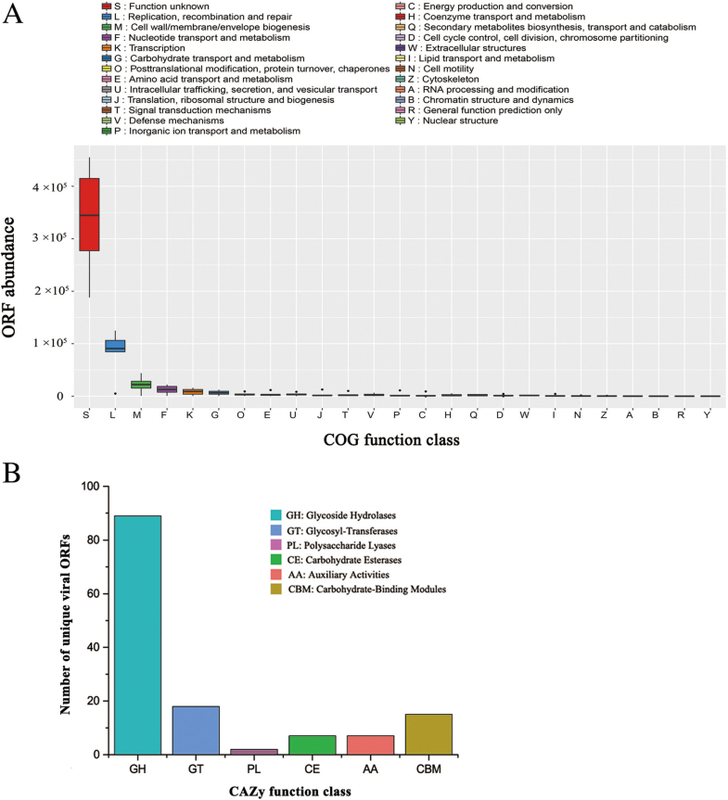 Given that microbes drive global biogeochemical cycles, and a large fraction of microbes is infected by viruses at any given time , viral-encoded AMGs must play important roles in global biogeochemistry and microbial metabolic evolution. Despite the ecological importance of mangrove ecosystem, our knowledge on mangrove biodiversity is notably limited. Previous reports mainly investigated the biodiversity of mangrove fauna, flora and bacterial communities [29, 30, 31]. Particularly, little information is available about viral communities and their roles in mangrove soil ecosystems [32, 33]. In view of the importance of viruses in structuring and regulating host communities and mediating element biogeochemical cycles, exploring viral communities in mangrove ecosystems is essential. Additionally, the intermittent flooding of sea water and resulting sharp transition of mangrove environments may result in substantially different genetic and functional diversity of bacterial and viral communities in mangrove soils compared with those of other systems . Therefore, in this study, we utilised high-depth sequencing and virome-specific bioinformatics tools to explore viral communities and their possible roles in mangrove ecosystems. 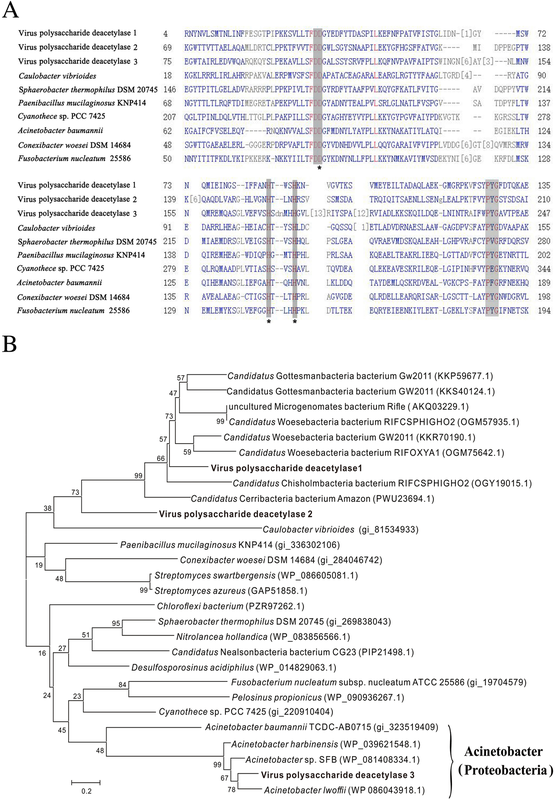 Viral taxonomic affiliations were determined by comparing the predicted virome ORFs against viral sequences from the National Center for Biotechnology Information (NCBI) RefSeqVirus database. 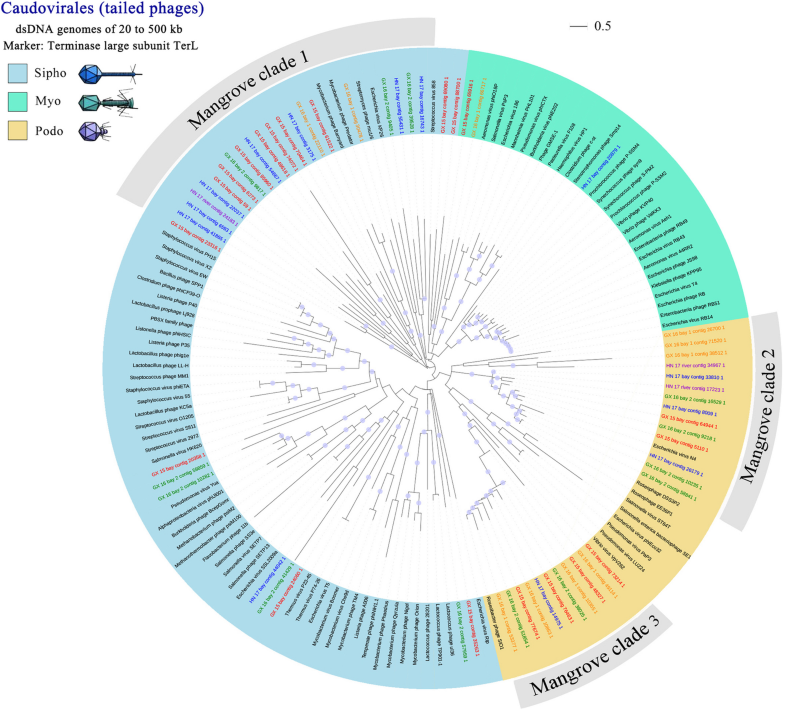 The mangrove viruses were largely unknown, as only a proportion of sequences was similar to any sequence in the RefSeqVirus database (Fig. 2a). A total of 51 viral families belonging to ssDNA, dsDNA and ssRNA viruses were identified in mangrove soil viruses. 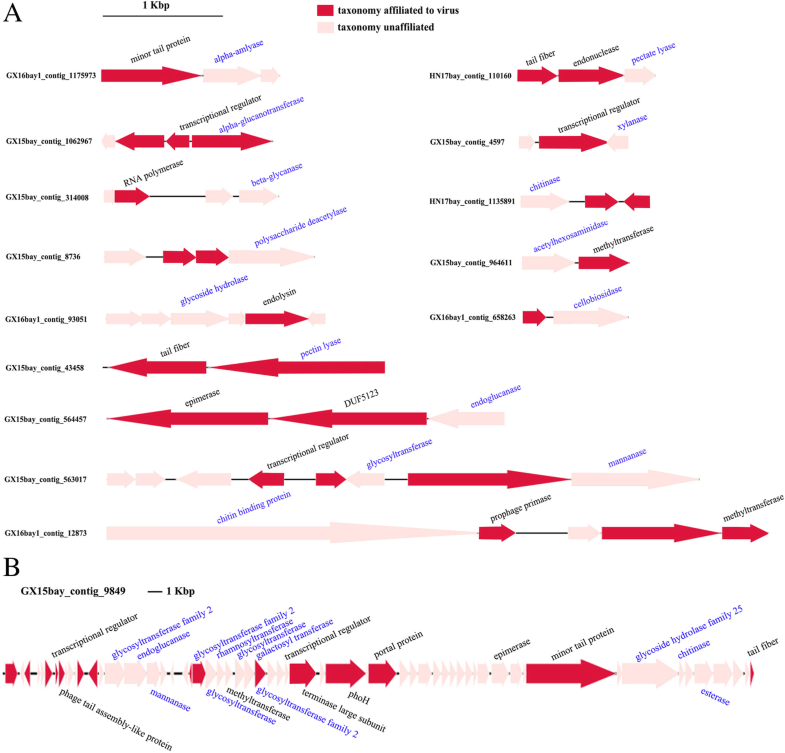 In all the virus-affiliated sequences, matches associated with ssDNA viruses were the most common, with primary assignment to the eukaryal ssDNA family Circoviridae (naturally infecting birds and mammals), ssDNA bacteriophage family Microviridae and eukaryal ssDNA family Nanoviridae (naturally infecting plants) (Fig. 2b). 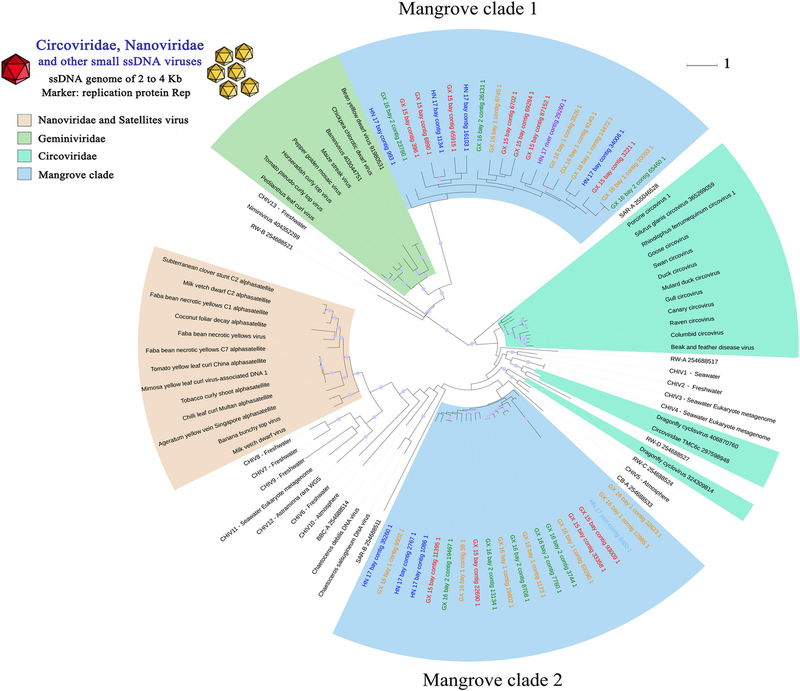 dsDNA viruses, which are most affiliated within the order Caudovirales (naturally infecting bacteria and archaea), accounted for the second largest fraction in mangrove soils. Other viral families identified at a relatively high abundance included Phycodnaviridae, Geminiviridae, Parvoviridae, Inoviridae and Mimiviridae. However, the high presence of ssDNA viruses in the mangrove soil viromes is most possibly due to the bias of multiple displacement amplification (MDA). MDA sufficiently augment the viral DNA for metagenomic analyses but will preferentially amplify genomes of ssDNA viruses and thus skew a quantitative taxonomic profile [35, 36, 37]. Therefore, for robust analysis of mangrove soil viruses and reliable ecological interpretations, all the results from these mangrove viromes will be analysed and reported in a qualitative manner hereafter in this study. Phylogenetic analyses of the major viral groups (circo-like viruses and Caudovirales) highlighted a remarkable diversity and previously unknown viral clades. 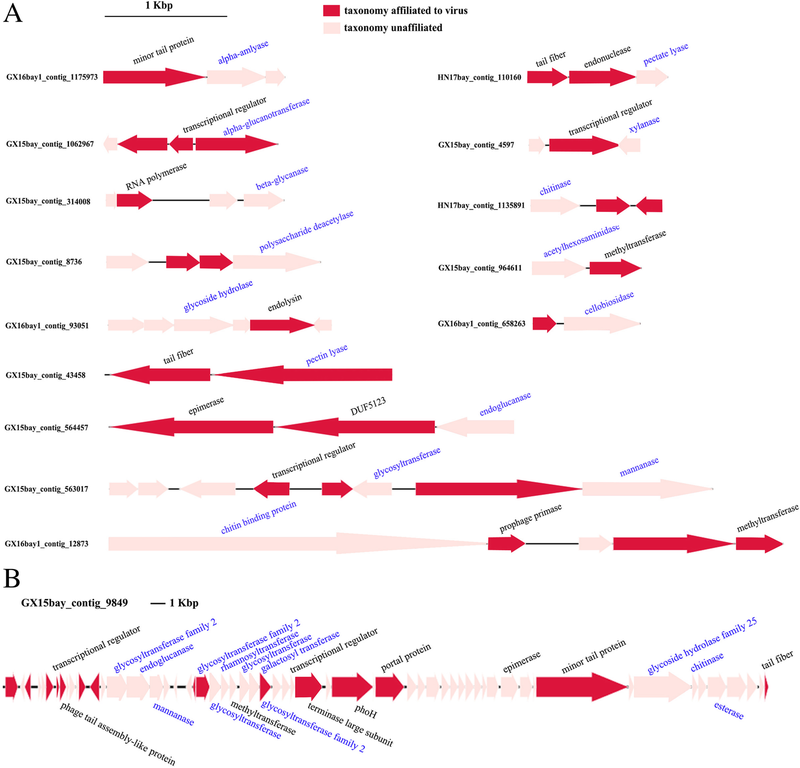 Notably, we identified two new mangrove clades with clear separation from known references and environmental metagenomic sequences in the Circo-like virus phylogenetic tree constructed from Rep protein (Fig. 3). Thus far, the astounding diversity of Circo-like virus has been uncovered from metagenomic studies [39, 40, 41, 42]. However, the exact evolutionary relationships among these viruses remain obscure. A previous study has demonstrated that chimeric ssRNA and ssDNA viruses (CHIVs) blur the evolutionary borders between the major groups of eukaryotic ssDNA viruses by capturing the capsid protein gene from RNA viruses and replacing Rep genes with distant counterparts from diverse ssDNA viruses . Interestingly, the two new mangrove clades were distant from known references and CHIVs and showed distinction from each other. As indicated in the phylogenetic tree, the mangrove clades that were intermediates between Circoviridae, Nanoviridae and Geminiviridae may provide additional clues to reveal the exact evolutionary relationships among these viruses. According to the genetic distance with references and animal and plant species inhabiting in mangroves, viruses of mangrove clade 1 most possibly infect mangrove trees, whereas those of clade 2 infect mangrove animals, such as crabs, shrimps, fishes and birds. Phylogenetic trees drawn from TerL also spotlighted the significant diversity and novelty of mangrove Caudovirales (Fig. 4). Although mangrove Caudovirales are widely distributed among the three-tailed phage family, most of the mangrove Terl sequences formed three novel clades with high internal diversity within Sipho- and Podoviridae families, highlighting an important uncharacterised diversity for Caudovirales in mangrove soils. Despite the diverse and far-from-reference characteristics of the mangrove virome sequences, the protein sequences of marker genes are relatively similar among the six-mangrove soil viromes. In addition, all the newly identified mangrove clades of Circo-like viruses and Caudovirales contained sequences from nearly every mangrove samples (Figs. 3 and 4, respectively) regardless of the significant differences of environmental factors (Additional file 1: Table S1) and the bacterial community structures (Additional file 1: Figure S6) between these samples. 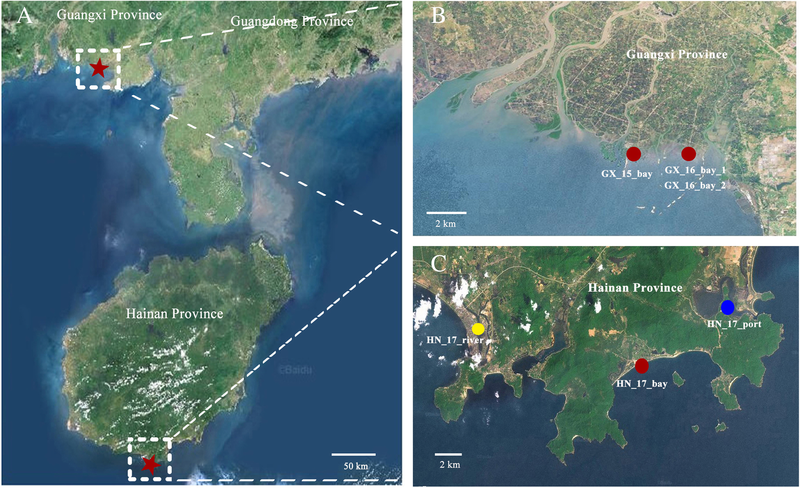 These mangrove viral communities are thus possibly composed of evolutionarily close viral genotypes and differ primarily in terms of community compositions. In contrast to the mixing/connectivity properties of aquatic systems, soil habitats are intrinsically heterogeneous and diverse . The spatial heterogeneity of soil structure and the resulting lack of connectivity of individual ‘island’ microbiomes within soil aggregates promote parallel microbial evolution trajectories. Such parallel evolutionary events are bound to increase local microbial diversities [43, 44]. However, mangrove soils are intermittently flooded with marine water. Consequently, the ‘island’ microbiomes can, to a certain extent, mix and diminish parallel evolutionary effects. Therefore, we speculate that the similar genetic features of mangrove soil viruses are probably due to the mixing and connectivity effects of marine tides; this assumption also supports the former hypothesis that viral diversity can reach high levels on a local scale but is relatively limited globally [45, 46, 47].